Closed Sales are down -10.4% for December 2018 in which the number of units closed was 749 compared to 836 in December 2017, with a decrease in cash sales of -8.8% compared to December 2017. New Pending Sales are down -6.7% and New Listings are up 0.7%. 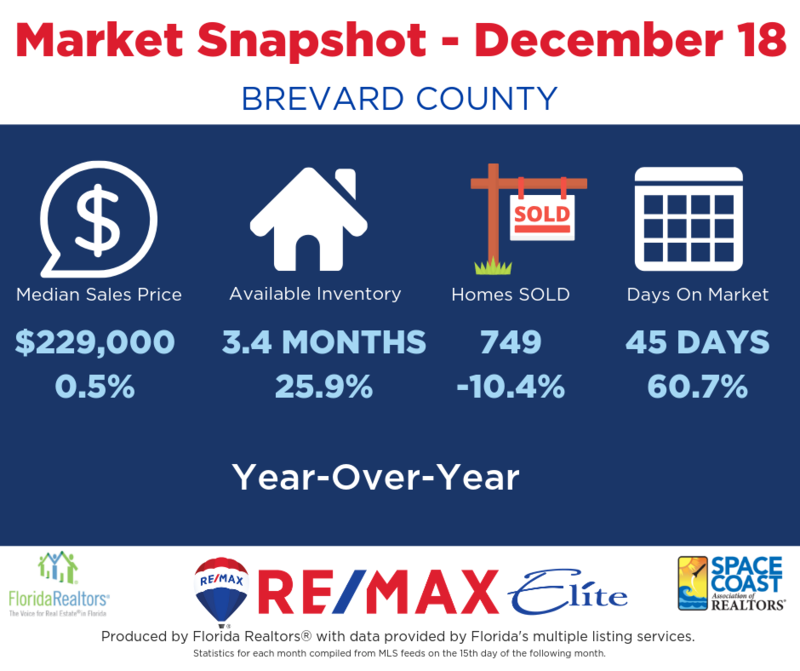 The Median Sales Price for Brevard Single Family homes is up 0.5% to $229,000 compared to a year ago, which was $227,789. Months Supply of Inventory is up 25.9% to 3.4 months, an increase from 2.7 months in 2017. Traditional Sales are down -11.8%, with a median sales price of $235,000. Foreclosure/REO Sales are up 38.5%, with a median sales price of $138,750. Short Sale Closings are down -40%, with a median sales price of $160,250. Closed Sales are down -10.7% for December 2018 in which the number of units closed was 192 compared to 215 in December 2017, with a decrease in cash sales of -17% compared to December 2017. New Pending Sales are down -21.4% and New Listings are down -4.1%. Median Sales Price for Townhomes/Condos is up 5.7% to $185,000 compared to a year ago, which was $175,000. Months Supply of Inventory increased to 3.8 months in December 2018 from 3.3 months in December 2017. Traditional Sales are down -8.7%, with a median sales price of $185,000. Foreclosure/REO Sales were down -55.6% with a median sales price of $250,125. There were no Short Sale Closings in December 2017 or December 2018. If you are thinking of buying or selling, let one of our professionals help!